The cute Sylvanian Families live in Sylvanian Village, where they enjoy a wonderful life. Whether spending time with their families and friends or just going about their daily lives, these charming little characters offer a wonderful world of imaginative play for your child. Created in the ‘80s, these nostalgic toys are beloved by many around the world. Now, your little one can discover the magic of Sylvania as well. 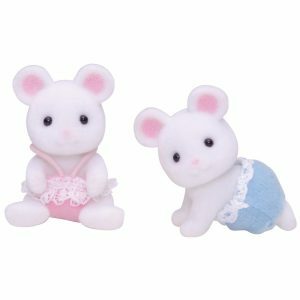 There are a range of Sylvanian Families for your child to collect and play with, including cats, dogs, mice, rabbits, squirrels and hamsters. The brand also offers a range of furniture and accessories to complete this fun and friendly make-believe world. Sylvanian Families aims to help children acquire social skills and learn about relationships, kindness and love with its toys.